Step by step configure and using SAMBA server on Fedora using system-config-samba configuration tool. Samba is the utility for file and printer sharing for both Linux and Windows operating system. In order to allow Windows user to access and grab files from your Linux Fedora Core system, you need to work on Samba server. The procedure below show step by step to setup Samba sever (Samba File Sharing server) on Linux Fedora Core 6 using graphical configuration tool system-config-samba, this artile also show the step on how to use and access your share folder, files and printer that located on Linux Fedora Core system from your Windows clients. 1. Backup all Samba configuration files. The Samba configuration file usually located under /etc/samba directory, follow command below to backup the configuration file using 'cp' command. NOTE: Best practice; before you doing any configuration is to make an back on the original configuration files. 2. Verify the backup procedure. 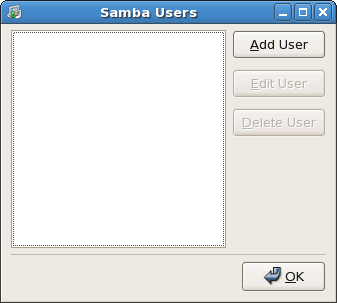 Open graphical Samba configuration tool. 1. 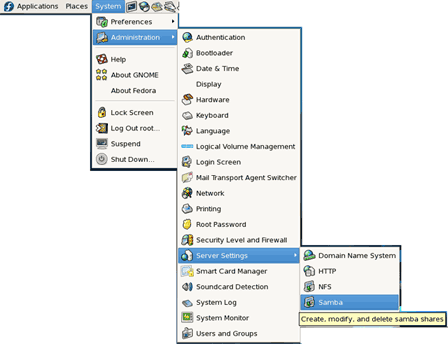 Then open graphical samba configuration tool by pointing and click to System menu button (on the Panel bar) -> Administration -> Server Setting and click on Samba, or you can open the graphical Samba configuration tool using x-terminal (x-term/GNOME terminal) and type in 'system-config-samba'. Figure: smb/samba_server_config.png above show the Samba Server Configuration (system-config-samba) tool window. 1. Click on Preferences on the menu bar to open Server Setting window. 2. 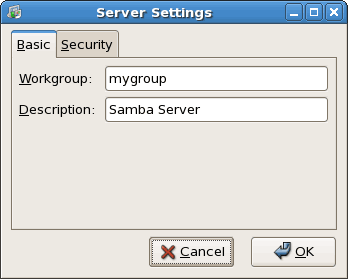 In the Server settings window, on the basic tab, you can setup or rename the samba Workgroup and short Description for the workgroup. Make sure that the name of samba Workgroup did not match any Workgroups or any Domains on your network. Figure: smb/server_setting_basic.png Samba Basic Server Setting example. ADS - Samba server act as a domain member in Active Directory domain. Domain - Samba server relies for primary or backup domain controller to passes the username and password. Server - Samba server verify the username and password on another samba sever, if fail then the samba server use the User authentication mode. Share - Samba sever only prompt for username and password when only user connect to specific share directory. 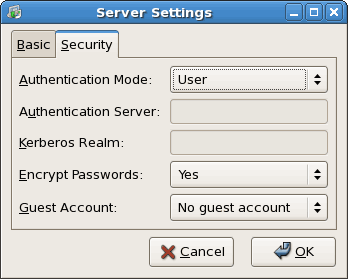 User - User authentication mode (default setting), the samba user must provide username and password on a per samba server basis. Figure: smb/server_setting_security.png Samba Security Server Settings example. 1. 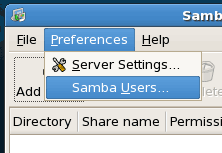 To create samba user go to Preferences tab, then click on Samba Users to open the Samba Users window. 2. 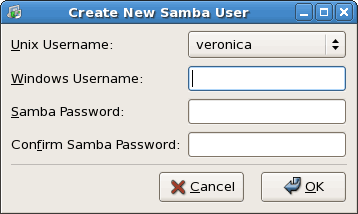 On the Samba Users window, click Add User button to open the Create New Samba User window. 3. Provide the necessary information for samba user on Create New Samba User window. Unix Username: Click and choose the username from local Fedora Core system user, you can add user to the list by using 'adduser' command. Windows Username: Provide the windows username for the samba user; make note that the Windows Username will be map with the Unix Username when user log in to the samba server. Note: You can use same username for both Unix Username: and Windows Username:. Samba Password: Provide the password for samba user in order enable them to login to samba server. Note: The password don't have to match the local Fedora Core user password neither the password from local user on Windows system. Confirm Samba Password: Retype the password. Then click OK button to proceed. 4. 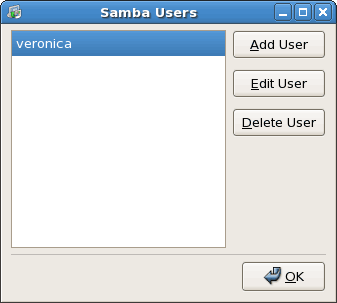 The screenshot of list of Samba Users available on the system. Click OK button after done with the samba user creation. Add Samba user using command line. 1. 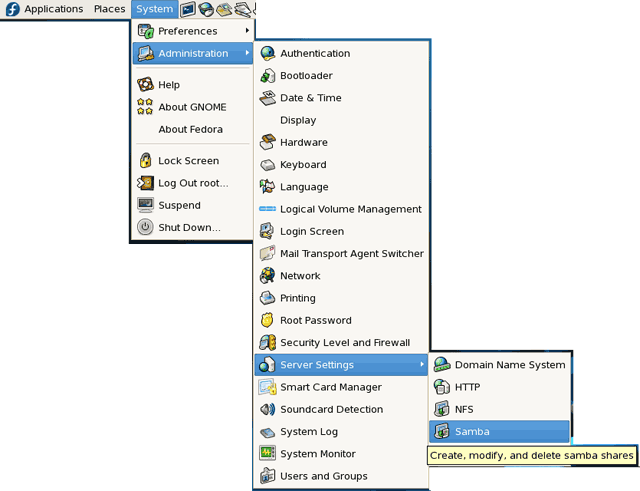 Add local user on Fedora Core system. Changing password for user kimura. 2. Add samba user and samba password in smbpasswd. 3. Verify and add user to the list of samba users (smbusers). drwxr-xr-x 9 root root 4096 Apr 3 04:40 .
drwxr-xr-x 25 root root 4096 Apr 3 03:42 ..
2. On the Create Samba share window, on the Basic tab, you can configure the samba share directory, share name and directory description. Remember that we already create the directory named smb_share, now click Browse button and point to the directory that we create earlier, then point and click the Access tab to proceed. 3. On the Access tab, you can specify the user that can be allow to access the share directory, you can select the user from the list or you can click the radio button to Allow accecc to everyone. 4. 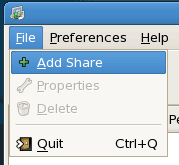 The example of samba share directory. Restart / Reload Samba server Configuration. After finish with all the configuration of samba sever it better that you restart the Samba Server to reload the samba config file. The command example below show the step by step to restart the Samba Server. Automatically start Samba server on start up. 1. Use the 'chkconfig' command to list the samba (smb) service automatically start on all runlevel. 2. The 'chkconfig' command below enable the samba server to automatically start when boot up, on runlevel 3 and runlevel 5. 3. Check to verify the configuration change. 1. The example of smb.conf, the samba sever configuration file, smbpasswd and smbuser file located in /etc/samba/ directory. 2. 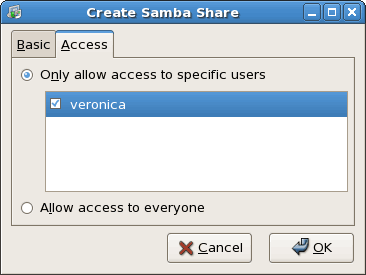 Access Samba share from Windows computer. 3. Mount Windows share from Fedora Core Linux. Keywords: samba server, configure samba, Linux samba server, setup samba on fedora, configure samba, samba file sever, system-config-samba, share printer, share file linux sharing, sharing file on linux, smbpasswd, smbusers, smb.conf, fedora share file. Submitted by rafeeq (not verified) on Thu, 07/28/2011 - 11:32.
excellent configuration its worked great yaar. Submitted by ajay Singh (not verified) on Sat, 10/13/2012 - 06:10.
it is good tutorial for Linux Administrator. thanks for good tutorial .